Surprisingly few historians have ever gone racing. Even fewer have placed a bet. Fewer still realize that for well over 200 years horse racing was widely regarded as England’s national sport. Loved by royalty, it was only post-1918 that soccer overtook it. Horse-racing is still the second most important social and economic sport in the United Kingdom. (A puff by Emeritus Prof. Allen Guttmann of Amherst College is on the cover, incidentally). It was almost accidental. I came to the world of academic history late in life, after leaving school at sixteen and lighting out over Europe, Africa and the Middle East, Did my doctorate at the age of fifty-four. 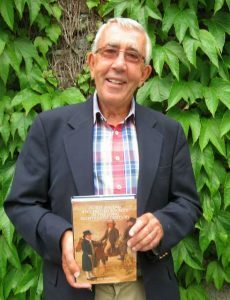 As a leisure historian I wrote books and articles on a wide range of topics, from Victorian vices to the world of sport. I knew that from the nineteenth century British racing was dominated by the Jockey Club, drawing its members from the aristocracy and landed gentry. Its historians always claimed that the Club, based at Newmarket and London, was first founded at the beginning of the 1750s. Quite accidently, when early newspapers began to be digitized and put on-line, I discovered references to a Newmarket Jockey Club with a much earlier existence going back to the 1720s if not beyond. This sparked my interest and raised further questions. But deciding to research the origins and cultural history of early racing was risky. This was not my period. It was way outside my comfort zone. There was a huge volume of unstudied material too, including newspapers, gentry archives, diaries and letters, racing art and urban records from racing towns like York and Chester. The findings were even more illuminating that I had hoped. Racing had a highly complex relationship with broader British society. I had not realized how important the annual racing week was in the leisure calendar of so many county and large market towns during the eighteenth century, helping foster consumerism and the urban renaissance. For many women of the middling classes for example, the racing was almost incidental, but was looked forward to for weeks before with a mixture of excitement and apprehension. It offered many social opportunities; socializing with the titled and the county set, attending assemblies, balls, the ordinaries or the theatre, appearing in the grandstand, and dressing up, demonstrating status and conspicuous consumption. Racing was equally significant politically. The early Jockey Club was much more than a racing club. Its members were mostly Protestant, Whig and committed to the defeat of Stuart Catholicism, and were usually MPs or otherwise leading figures in the political elite, like the Duke of Bolton. Racing played across divisions of Whig and Tory, court and country or Hanover and Jacobite in complex ways. Hanoverian sons demonstrated their independence against their father by spending money racing. Race meetings were sites of assembly for political discourse where prospective and current parliamentarians lobbied for support, exploited the dynamics of patronage, or used attenders as focus groups. Conventional histories often portrayed honest, aristocratic Jockey Club members facing dishonest, cheating working-class blacklegs who were corrupting the gaming world. The real situation proved much more complex. There was dishonesty and honesty at all levels of the gaming world, and many examples of cross-class gaming alliance and odds manipulation in the embryonic betting market. Horses could be deliberately run to lose as well as to win. It became very clear that racing had been the first proto-modern sport, changing over the period from a marginal and informal interest for some of the elite to become the most significant leisure event of the summer season. The way rules and racing organisation developed over times proved fascinating too. The research also shed light on the hitherto hidden world of racing’s key professionals: jockeys, trainers, bloodstock breeders, stud grooms and stable hands. I had not previously been aware that many jockeys and trainers were literate, numerate, socially mobile, handling large sums of money and sometimes wealthy enough to be landowners and leading figures in their communities. All in all, this book changed my own views radically about the early racing world. Writer on sports history, leisure history and the history of popular culture. Mike Huggins is Emeritus Professor of Cultural History at the University of Cumbria. His research interests, expertise and experience lie in the history of British sport, leisure and popular culture in the nineteenth and twentieth centuries, and the opening up of a wider range of evidence for their study, including visual and material primary sources.